The fact that the John Krause House sits where it does is something which has puzzled some historians. The house was designed with strong Prairie Style influences, much as its two-block-away neighbor, the Rufus Kern House at number 608 Park Avenue West. These two houses were built in a style which was not often found on Midwest main streets, as the influence of architects such as Frank Lloyd Wright was considered a bit “modern” and not exactly mainstream. Given that the Krause House at 428 Park Avenue West was built at nearly the same time as the Kern House, it is entirely likely that architect Vernon Redding – the architect of the latter – designed the former as well. John Krause was born in Mansfield in 1848, the son of a German grocer who came to the United States the year before. After assisting his father and eventually taking over the business, Krause cast his lot as head of the Mansfield Ice Company and with other manufacturing concerns. He went on to join the Bank of Mansfield, which had been established in 1892, and became its President in 1918. Krause also served in public and civic capacities, including as Treasurer of Madison Township and with the Knights of Pythias and the Elks Club. Before building his Park Avenue West residence, Krause had lived in a house he had built at 133 North Walnut Street about 1878 (no longer standing). John Krause was married to Amelia Bush, and they had one child who lived to adulthood – Albert. As noted above, the house has influences of the Prairie Style of architecture. It had a Spanish tiled roof when constructed, and featured horizontal lines, a great overhanging roof, and casement windows. A very large front porch was supported by three bracketed columns. It was on this porch, in fact, that John Krause died on August 3, 1921. Having had foot surgery some time before but on the road to recovery, he passed away while sitting on the porch in conversation with a friend. Krause’s funeral was held at nearby St. Luke Lutheran Church. 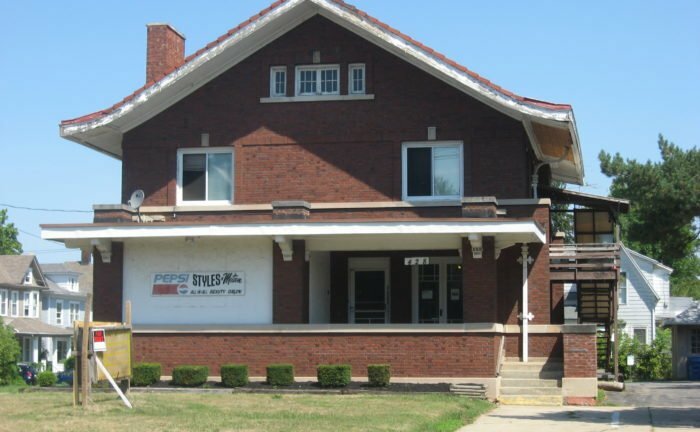 In later year, the house would become a commercial property, including housing a real estate office, beauty supply business, and the Unity Center. It is listed on the National Register of Historic Places.